All is well that ends well as far as the country’s hosting of the 30th Southeast Asian Games on Nov. 30-Dec.12. 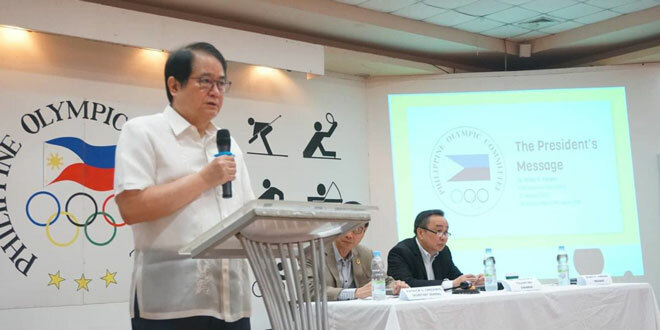 The Philippine Olympic Committee (POC), headed by president Ricky Vargas, will make sure about it, according to POC secretary-general Karen Tanchanco-Caballero. “One thing we (POC) can assure all of you now is that the 30th Southeast Asian Games is still happening in the Philippines come November 30,” said Caballero during her appearance in the 16th “Usapang Sports” presented by the Tabloid Organization in Philippine Sports (TOPS) at the National Press Club in Intramuros on Thursday. Caballero, also the president of Pilipinas Sepak Takraw Association, debunked earlier reports that the country is relinquishing its right to host the SEA Games to either Thailand or Indonesia. “That’s not true (giving up as host). In fact, POC president Vargas reiterated our commitment as host during our recent POC meeting last March 21,” Caballero said. “We’re still very much on board. We’re hopeful that other groups involved like the PSC (Philippine Sports Commission) under Chairman Butch Ramirez, and PHISGOC (Philippine Southeast Asian Games Organizing Committee), headed by Sen. Allan Cayetano are also on board,” she added. Caballero also clarified the roles of the POC and PHISGOC as far as hosting the SEA Games. “PHISGOC has the marketing and broadcasting team under them. Our concentration is sports side and game services,” said Caballero, who works as vice chair under POC Chairman and Cong. Abraham “Bambol” Tolentino. Asked about the venues to be used in the biennial event which the country is hosting for the fourth time, Caballero said SEAG venue director David Carter of judo said 90-95 percent of venues are already confirmed. “I was told about 90-95 percent of our venues are ready. New Clark City is hosting two compulsory sports – athletics and aquatics. And based on our discussions with the BCDA, construction is right ahead on schedule. We’re confident we will be able to deliver them in the next few weeks or months,” Caballero said. Appearing with Caballero during the first part of the weekly sports forum supported by the PSC and NPC and shown on Facebook live via Glitter Livestream are World Rugby Council member Ada Milby and Beach Volleyball Republic founder Bea Tan, who talked about their advocacy in their respective sports.